Panorama de Leeuw XLVI: Reinbert de Leeuw turns 80! With her biography Reinbert de Leeuw, mens of melodie Thea Derks is following the musical career of Reinbert de Leeuw. Saturday 8 September Reinbert de Leeuws turns 80 years old. To celebrate this special day there is a tribute dedicated to this man in the Muziekgebouw at the IJ in Amsterdam. The only answer he gave when we asked what he would like to hear most was: “Surprise me”. It is for that reason we haven’t announced the programme but one thing is certain: Soprano Barbara Hannigan is in. The album Vienna: Fin de Sciècle will be released soon. On this album led by De Leeuw she and others like Arnold Schönberg and Alma Mahler will be singing. Thursday 13 September in the Muziekgebouw Thea Derks hosts Een os op het dak: moderne muziek na 1900 in vogelvlucht. In this booklet she educates all who is interested in music about the musical developments of the twentieth and twenty-first century. Contrary to the regular history books which mostly lack female composers she shines her light on these often underrated composers. 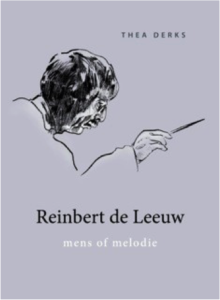 Tip: if you purchase Reinbert de Leeuw’s biography using this link you support the Concertzender free of charge. Barbara Hannigan, soprano. Reinbert de Leeuw, piano. Sofia Goebajdoelina. Introitus, Concert for piano and orchestra. Béatrice Rauchs, piano. Kyiv Chamber Players led by Vladimir Kozhukhar.